Located near all DC has to offer, restaurants, museums, national monuments, shopping, etc. Verizon Center is a 2 block walk. The Convention Center is a 5 block walk. The Smithsonian Art Museum is across the street along with the DC Metro - Chinatown Station. 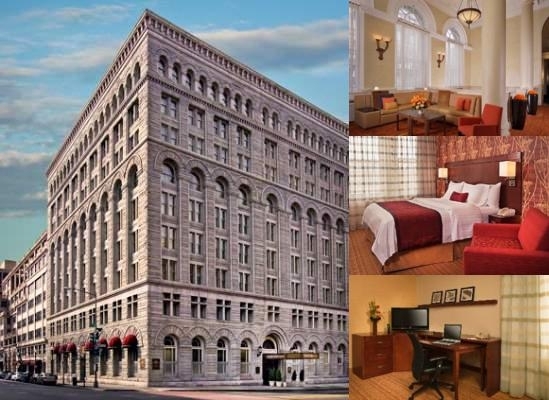 Originally built in 1891 as the Washington Loan and Trust Company, the Courtyard by Marriott Convention Center underwent a twenty million dollar renovation in 1999 to become the beautifully restored building that is seen today. The Courtyard by Marriott Convention Center is located in the historic Penn Quarter District and is ideally located near all Washington, DC has to offer. It is within walking distance of the Verizon Center, Smithsonian Museums, International Spy Museum Washington Convention Center, and much more. This historic structure was acquired by a group of local developers and investors for conversion to hotel use in 1977. While the upper floors were converted into guest rooms, the tenth floor board room was retained to showcase its beautiful plaster ceiling, marble fireplace, and decorative wood paneling. This is now the Penn Quarter Room and used for small meetings and gatherings.The majority of the first floor is currently occupied by the Gordon Biersch Restaurant & Brewery, however, the 1927 addition to the bank lobby now serves as the hotel lobby and front desk area. The safe deposit department in the lower level, along with the main vault, has been converted to The Bistro, serving breakfast daily. You'll also find the complimentary business center and work/entertainment space. Some of the original 1891 design elements, including the marble columns, mosaic tile floors, and the original bank vault are displayed in the hotel, and can be seen in the pool area and fitness center, also located on the lower level. Each room is equipped with a microwave, mini fridge and Keurig coffee maker.The hotel sits right outside of Chinatown and is in one of the most lively neighborhoods of the city. Guests can comfortable walk to the many restaurants nearby and to the Smithsonian museums. A small indoor pool and whirlpool is available 24 hours a day. Reagan National Airport is 15 minutes from the property. The subway costs $5 and a taxi is $15.